Do you cringe at flabby and tough chicken skin? Sometimes in competition and home cooking chicken skin can be undesirable because of the texture. 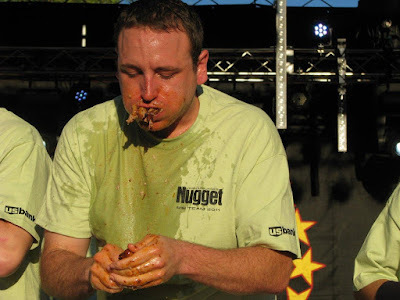 Competitors go to great length to remedy this chicken tragedy. Cooking at low and slow temperatures just does not crisp up the skin properly. We have purchased a meat tenderizer that has fifty six very sharp blades to pierce said chicken skin. The theory behind this madness is; piercing the skin in multiple locations will allow the fat to render through out the holes to allow skin to crisp. We are going to give this a try. Warning these fifty six needle blades are sharp. Just ask Ms. Goofy who took one for the team while washing this contraption. She is okay, sporting a fresh bandaged and a sore finger. We took the tenderizer and punctured the skin of trimmed chicken thighs. This machine worked like a charm with very little effort. The very very sharp needles went right through the skin and possibly into the meat. We left several thighs un-punctured for test purposes. We cooked the seasoned thighs in an indirect fire in a covered kettle. We used a fairly high heat of about 300 degrees. We used the higher heat because we were impatient for dinner. They were cooked to about 170 degree internal temperature and then were sauced. They all looked fantastic. You could see a visible difference in the tenderized thighs. The skin had shrunk slightly more than the unaltered thighs. We sampled the two differently prepared thighs. The tenderized chicken had a slightly crisper chicken skin, but, it was not perfectly bite through. The taste was excellent from the cooking method, seasoning and sauce. The unaltered thigh tasted good but the skin was flabby and tough. Overall this was a partial success. The tenderizing fifty six blade machine did have an effect with the texture of our finished product. It was not perfect. Combine this with other competition chicken cooking techniques and you will have that perfect bite through skin. There always is the old fashion method of cooking chicken directly over the fire and you will have crispy charred bite through skin. It sure is fun tasting our research. 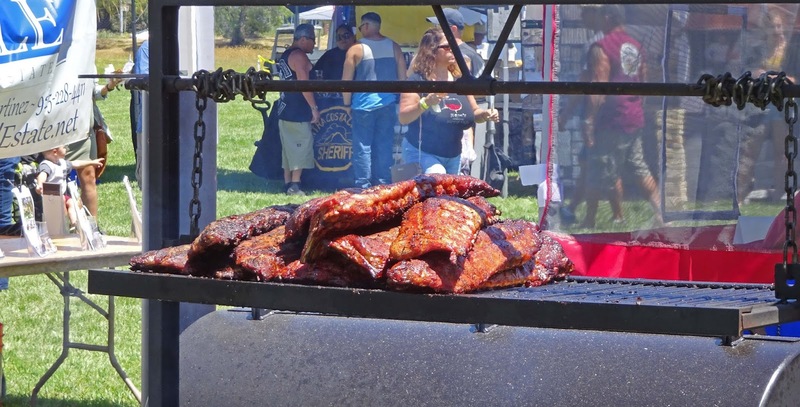 The weather heated up for the 7th Annual Silicon Valley BBQ Championship. The news cycle must of been slow because the weatherman was threatening triple digits. 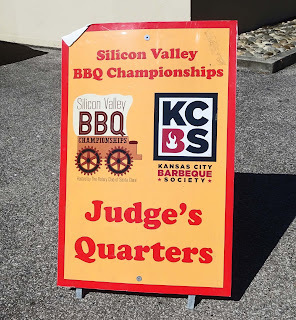 It was in the 90's for 40 professional barbeque teams to cook a Kansas City Barbecue Society sanctioned four meat contest consisting of chicken, ribs, pork and brisket. 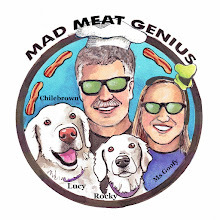 Ms. Goofy donned our judges badges and this souvenir pin to judge some very fine barbequed meats. Let's take a short, hot stroll of the activities. 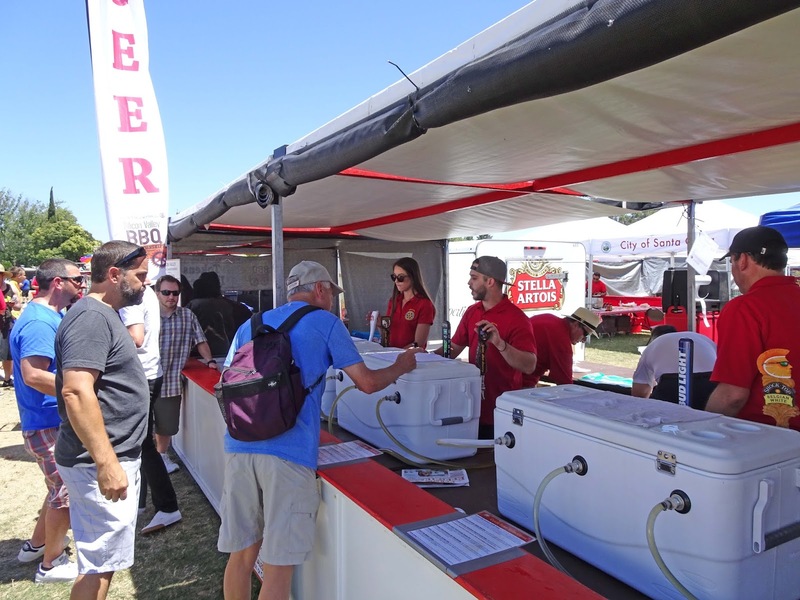 The beverage booth had plenty of business today. The imbibers then huddled under a tent for shade and relief from the sun. 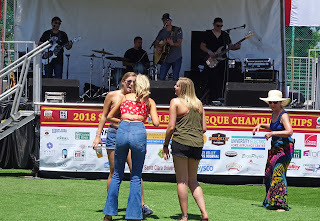 The main stage had a band and only a few brave women danced in the midday heat. I have to admit the judges were sequestered in an air conditioned room. Today's event was sponsored by the Santa Clara Rotary. They spoiled us as judges. They gave us a goodie bag full of candy and a souvenir pin. They also baked us three different flavored brownies to snack on after our judging duties. I ate mine and Ms. Goofy's. I crave sweets after eating so much delicious meat. Okay I crave sweets all the time. 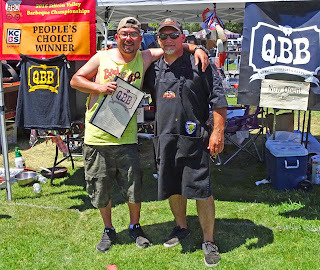 The Grand Champion today was the bbq team "Burnin And Lootin". Santa Clara Silicon Valley knows how to throw a barbeque contest. 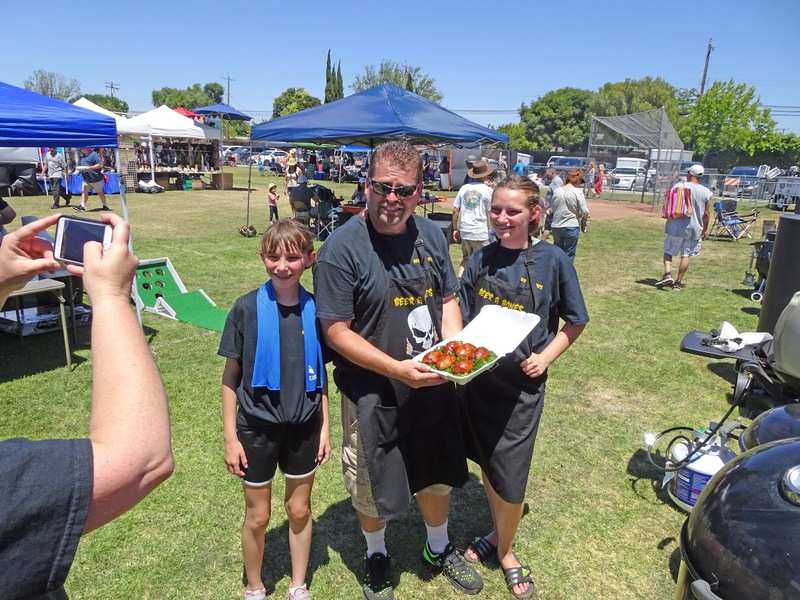 The heat did not damper the mood and spirit of participants to have a great time. Luckily the temperatures have dropped back down to the Bay Area norms. We have a little temperature bump and we panic. So until the next contest we bid adieu. There was a protest at the bbq contest in Martinez this Fathers Day weekend. We briefly stopped by to visit with some of the competitors but left before the brawl happened. 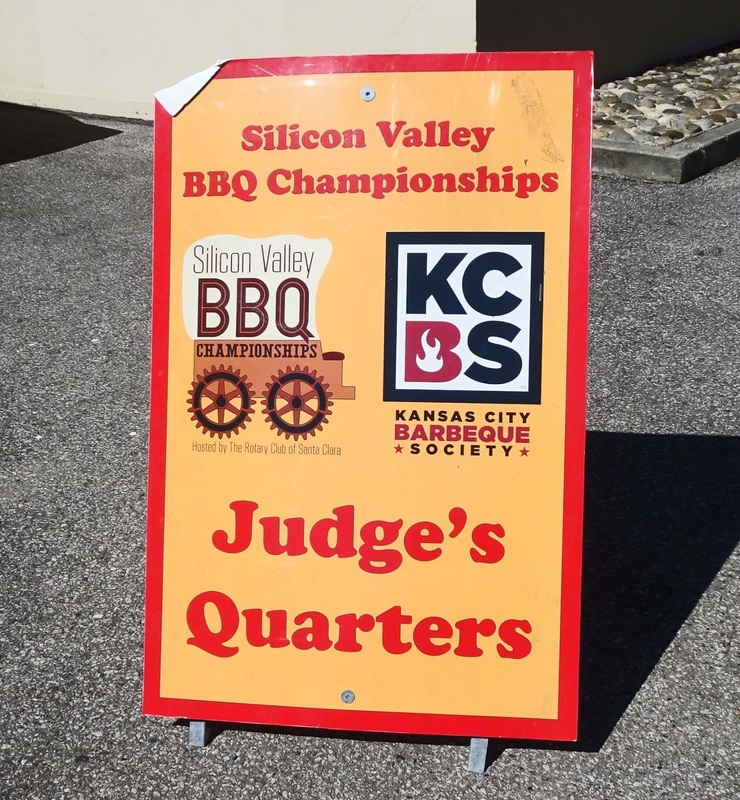 This contest was not a Kansas City Barbecue Society sanctioned event and our judging services were not needed today. 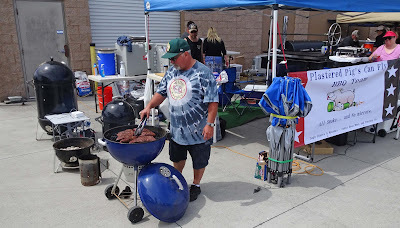 It still was a fun event that showcased a lot of local backyard bbq enthusiasts. There were a lot of families enjoying this day. This was a festival that should of been a fun and safe place to enjoy the weekend. This was all shattered by a crazed, misguided, disruptive, anti-social group that goes by the name of Direct Action. They have been responsible for other protests in the Bay Area and we witnessed their shenanigans at the S.F. BBQ festival. It was time to give out the awards to the bbq competitors. A gentleman rushed the stage with a ruse of needing the microphone to find his lost child. He grabbed the M.C. mike. He then started to spew his anti-meat propaganda. The mike was physically taken back but this was only the beginning of the chaos. More protesters took the stage and did what they do; annoy and disrupt. The details are a little sketchy but violence erupted with some people getting hurt. 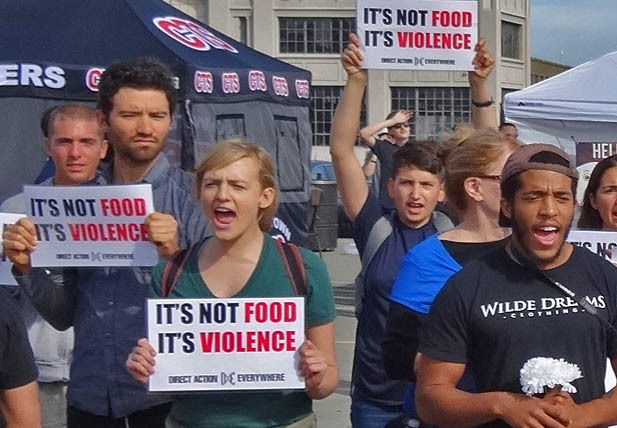 A spokesman for the protesters compared meat consumption to eating a human child and denied that her group was responsible for violence. Regardless of who started the violence this groups actions caused the violence. Oh my. 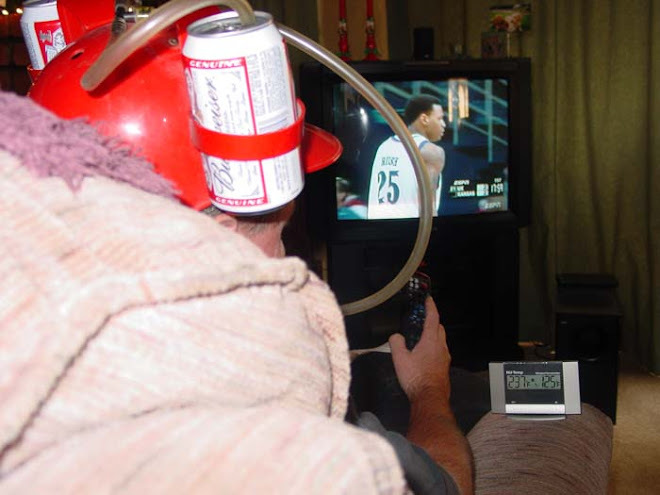 This is life in the Bay Area. Never a dull moment. Here is a link to the local news coverage of the protest. 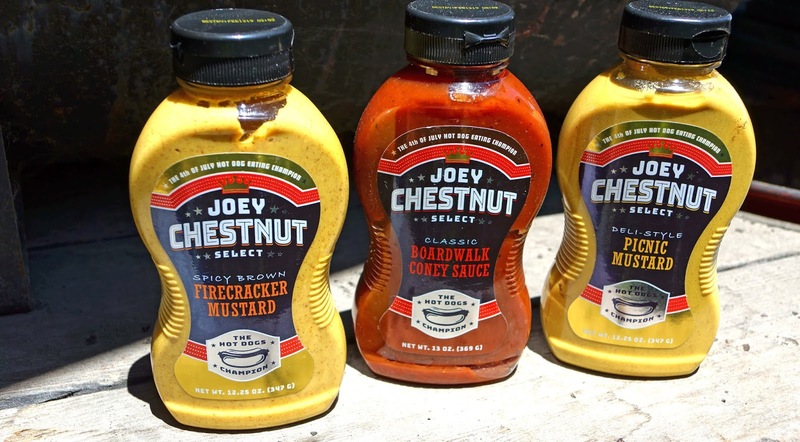 Joey Chestnut the World Hot Dog Eating Champion has ventured into the condiment world. We are big fans of this trencherman and have witnessed him devour 10lbs of ribs several times at the Sparks Rib Cook-off.. If Joey endorses this mustard, that is good enough for us. We purchased his whole line-up of condiments. Today we are going to try the Picnic mustard on some sausage. It may not be 4th of July but let's light some fireworks and eat some dogs. The ingredient list is short and sweet; mustard seed, vinegar and spices. The top is removed to let a familiar mustard aroma escape. 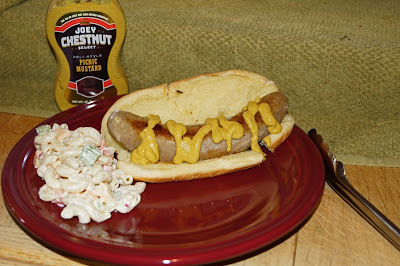 I squirted some onto my sausage and was immediately a little put back because liquid only came out. This was because the mixture had separated. This happens and a quick shake and we were back on track. The texture was smooth. It had a mustard bite but was mild. I enjoyed it. There was nothing that rocked my boat but this was basically table mustard. Ms. Goofy on the other hand did not like it. She claimed it had a sour taste. After she mentioned this I tasted a little sourness possibly from the vinegar. We all have different likes and dislikes. Joey is one of my food hero's. He is marketing and cashing in on his fleeting fame. I think his Picnic mustard is a decent condiment that I will use. It may not be everybody's favorite like Ms.Goofy. We both will be rooting for Joey this 4th of July when he defends his World Hot Dog Eating title. Where have we been? 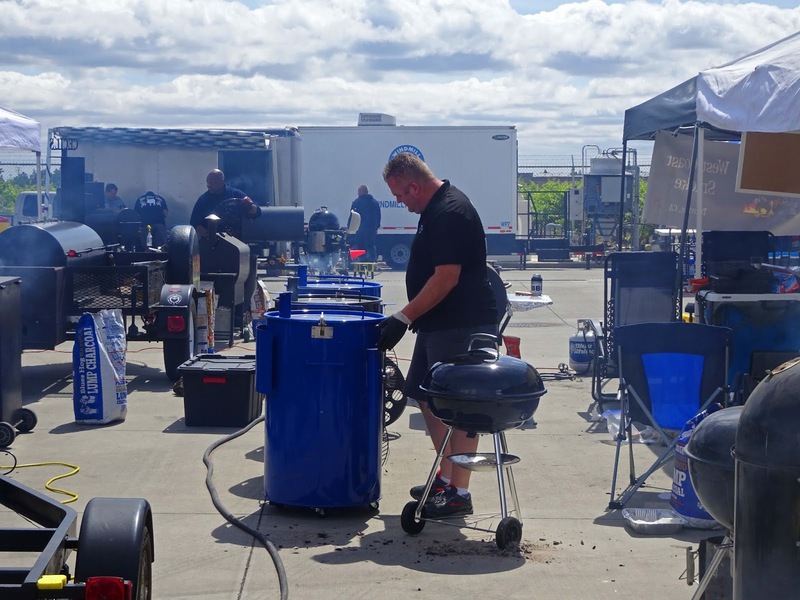 It seems like an eternity since our last bbq competition. 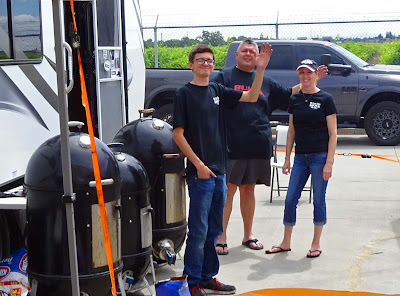 We are at the Van Ruiten Winery for a bbq competition that also is a fundraiser for the charity group "Autism Speaks". Van Ruiten winery is located in Lodi California one of the states premium wine growing regions. In fact our venue is located right smack in the middle of a working vineyard. 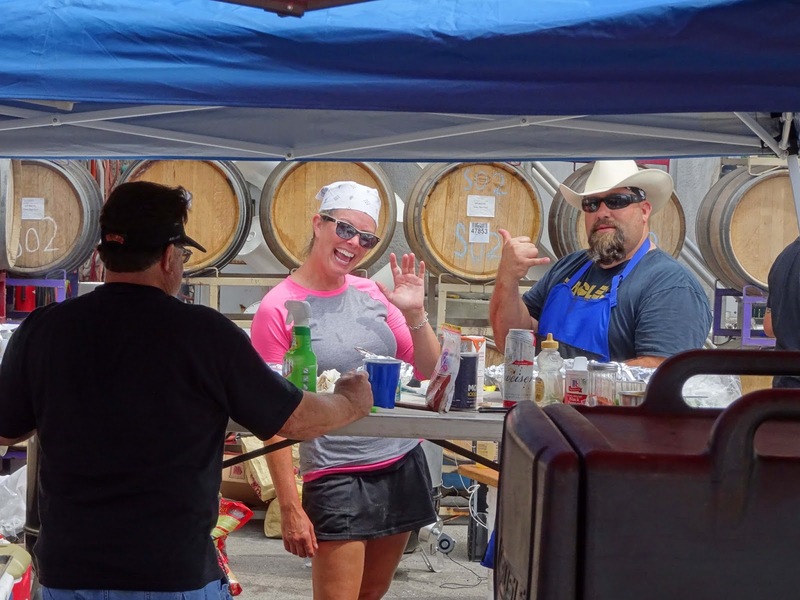 It was a grand day to judge some bbq and drink some wine. We would love to share some images with you. No, Ms. Goofy did not upgrade the Racing Honda. We are in wine country and what better way to arrive but in a bright red Ferrari. Today was the perfect day with temperatures in the 70's. The breeze was a little challenging for the cooks but they are professionals. The judges were very hard at work today. We had tri-tip, ribs and a mystery meat to judge. The mystery meat was revealed to be chicken. The competitors had to cook their chicken in a bbq but they could present it anyway they thought would wow the judges. 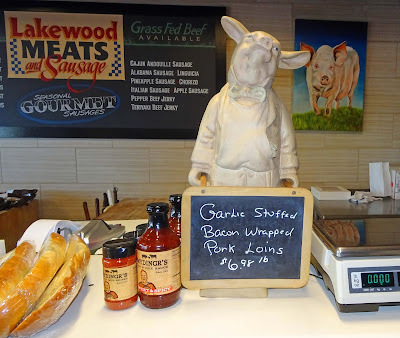 We saw everything from tacos, sausage, chicken topped raviolis, puff pastry topped with chicken and one of my favorites bacon wrapped cream cheese filled chicken rolls. This was a fun and tasty category. 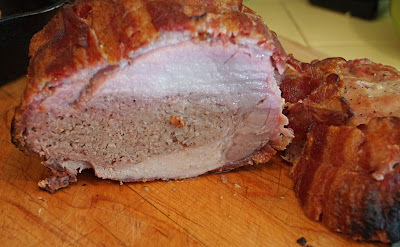 This was an entry from the category of "Mystery Meat". 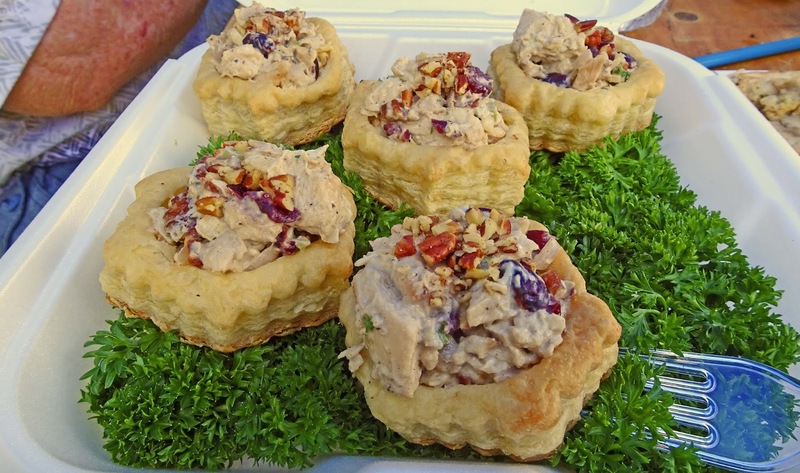 The competitor used his bbq chicken to make a very delicious salad. 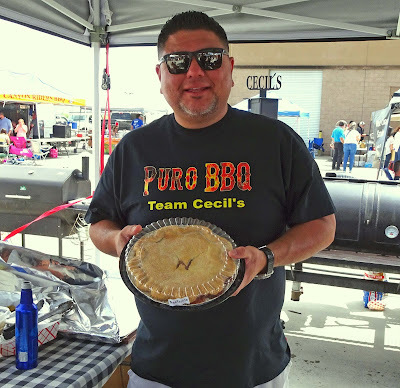 They then baked some puff pastry in their bbq. 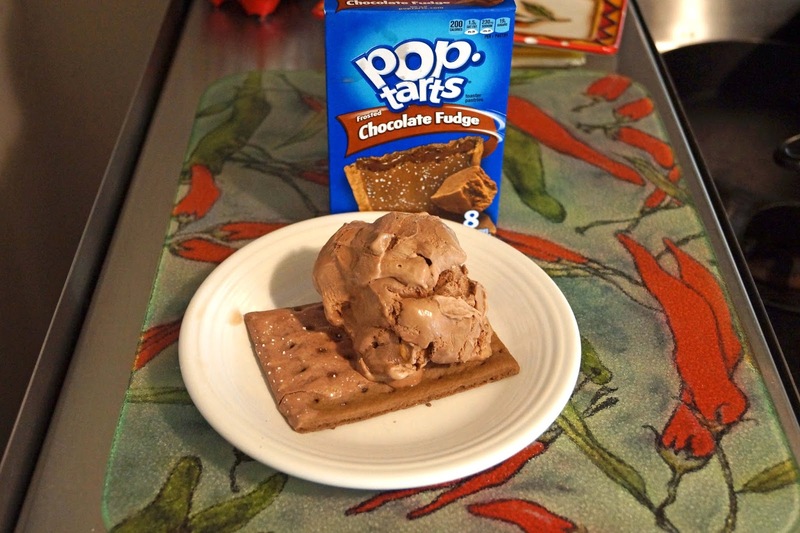 They were combined to make a very scrumptious entry. It did not win first place but it sure was tasty. The public was able to meet and greet the competitive bbq teams. 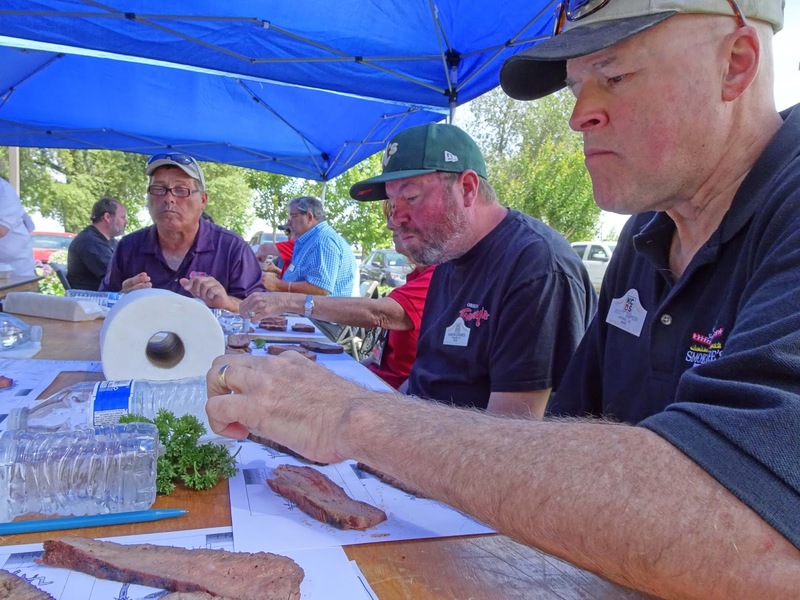 This was an intimate setting that gave an up close look at the workings of a competition. 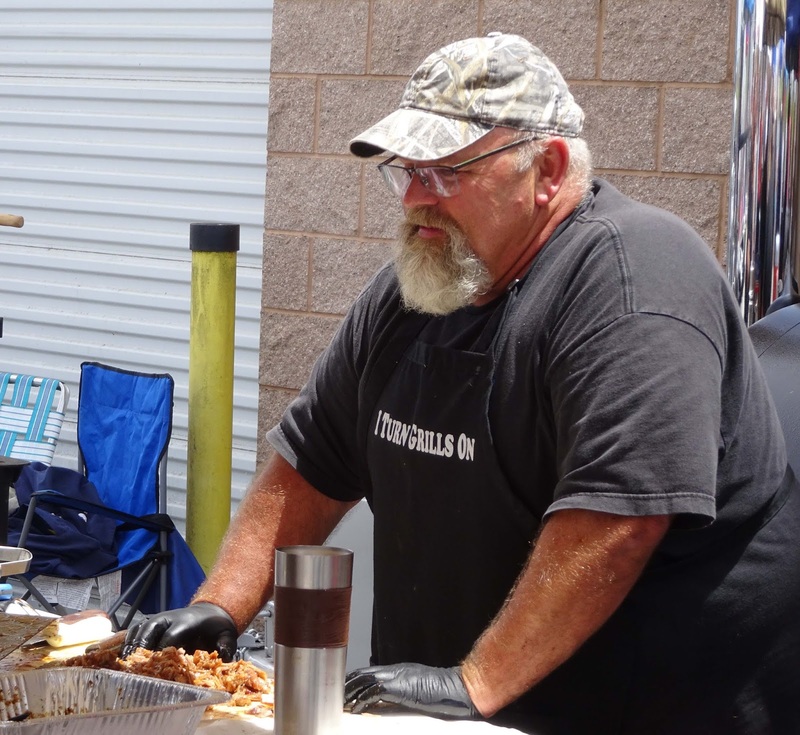 The public was allowed to buy food and drink tickets to sample award winning bbq. They also got to try some of our gracious hosts, Van Ruiten premium wines. There was a band to entertain. 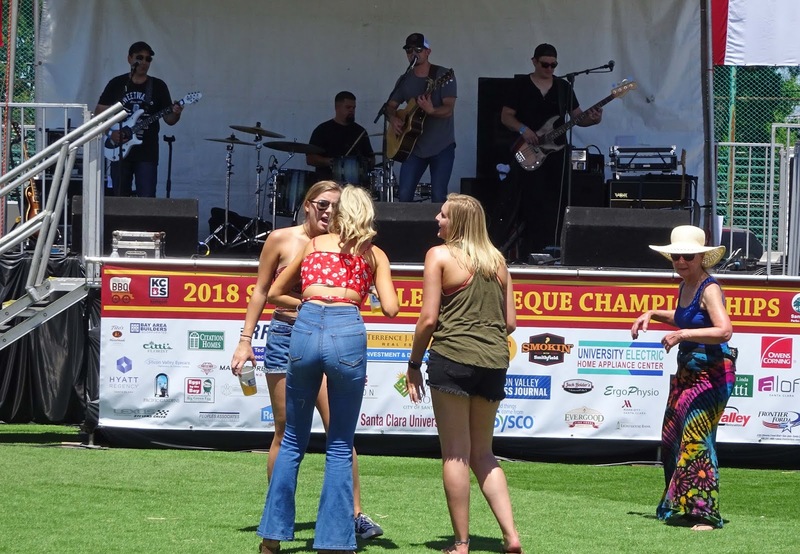 While one was listening to the music they could stroll the large raffle prize area to purchase chances of winning while benefiting 'Autism Speaks". I dropped my tickets in the shiny new red Weber BBQ box. 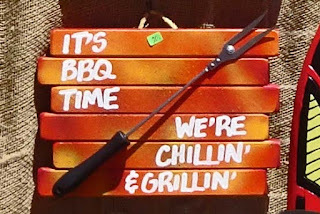 (never enough of shiny new bbqs I always say). 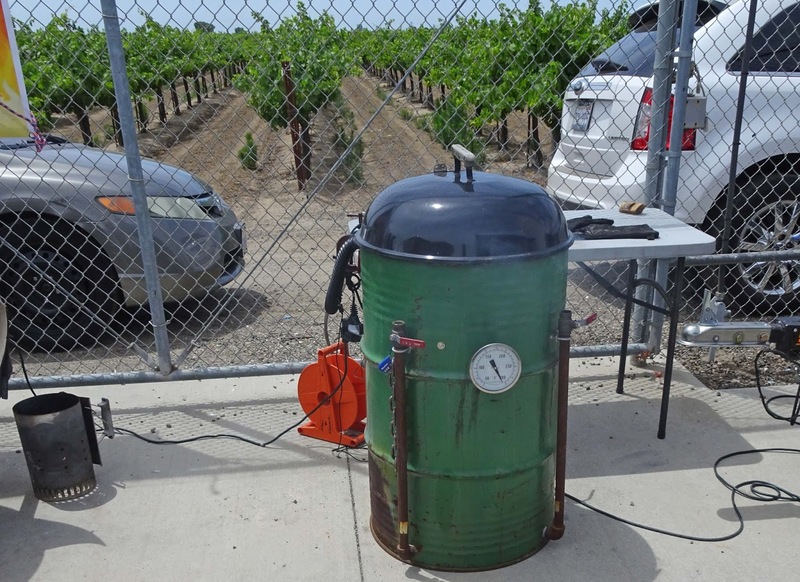 This last image is of an Ugly Drum Smoker referred to as a UDS. It is amazing how such a simple cooking vessel can turn out championship bbq. The real reason I wanted to show you this shot was to demonstrate that we were situated right smack in the middle of a working vineyard. It does not get any more California than that. Congratulations to our friends Gina & Jack of Big Shot BBQ for winning the Grand Championship. We cannot wait till the next event. Alden is a serious Chilehead. He lives across the country in Maryland and we correspond about all things pepper. Almost a year and one half ago he started making a hot sauce from some very exotic peppers that he grew in his garden. They had names like Chocolate Scorpion and Congo. They sound hot. He made a mash and put in in a wooden barrel to age and ferment. He just recently opened this barrel and bottled this elixir. Yours truly received one of these special sauces. I jotted down a couple of notes from my initial tasting that I would like to share with you. The aroma has the unmistakable hint of fruity exotic peppers. I immediately removed the flow restrictor (personal pet peeve dislike of flow restrictors) and poured a little on the back of my hand. 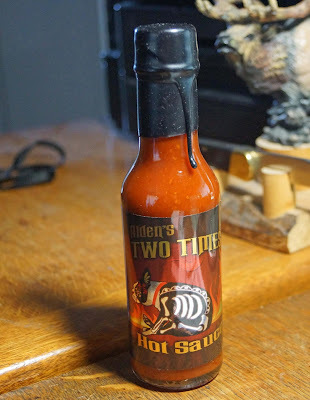 The little I did taste ignited the heat scale to 4 out of 5 stars and this heat kept on climbing with afterburner goodness. I detected a little sourness maybe from the fermentation. I hate to use the word Umami but it did have the quality and savory that triggers craving for another taste. I realized I could not eat this straight so I opted for pizza. I admit that I did overdue it with sauce. It burns so good. Also this sauce has a balance and roundness of salt, sweet and sour with the pepper hint of fruitiness that I associated with exotics.(peppers). 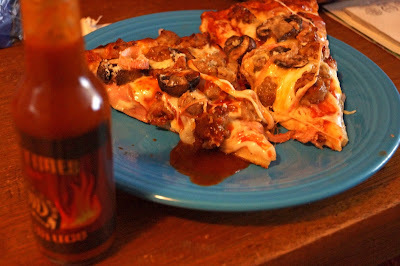 There is no comparison to the National brand of fermented sauce from Avery Island. This sauce has body and the National brand is watery in my opinion. I could go on and on about how great this sauce is and I will. I need to let my taste buds rejuvenate before I savor this sauce some more. I most likely did some taste receptor damage tonight. I do admit that I replaced the flow restrictor but only temporarily. Alden, Thankyou and Bravo.